I will be the first to admit that I love me some boxed mac and cheese. Let’s be honest, who doesn’t?! It’s also one of the only foods that Crosby willingly eats and I’m convinced that kids just pop out knowing that mac and cheese and pizza are the two foods they will eat. To my credit, he can tear up a green smoothie too, but mac and cheese is most definitely a favorite around here. In the span of the last two weeks we had eaten boxed mac and cheese for 3 meals and my poor husband, bless his heart, was sick of it. I can’t say no to Annie’s organic mac and cheese, but I found it pretty funny that I had made something so much that my husband who never complains was sick of it. This recipe is made in less than 30 minutes and so simple to make! First, grab your frozen broccoli from the freezer and set it on the counter. We are going to let it start to thaw out while the rest of the meal is cooking. While your garlic and onion are cooking, start your pasta on another burner. 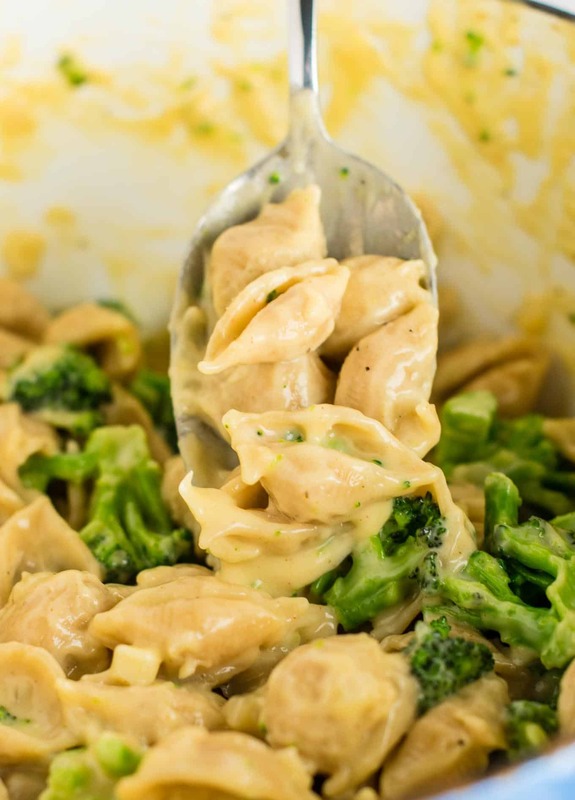 Once the garlic and onion have cooked down, add in the remaining ingredients for the cheese sauce and whisk until you have a nice and thick cheesy sauce. 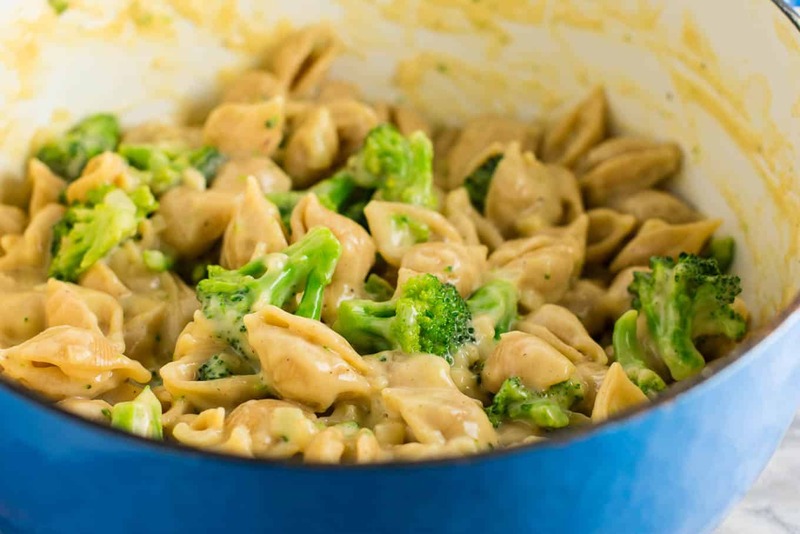 Once your sauce is done, add in the cooked pasta and the broccoli, and stir until broccoli is hot. Salt and pepper to taste and dinner is served! 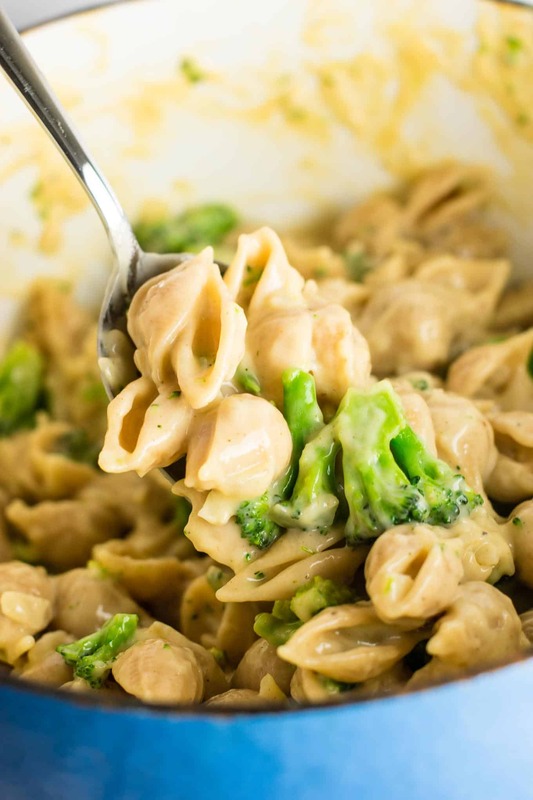 Pasta + cheese will never not be one of my favorite foods, so I decided to create this broccoli shells and cheese recipe as the healthiest possible way to justify eating mac and cheese for a meal. 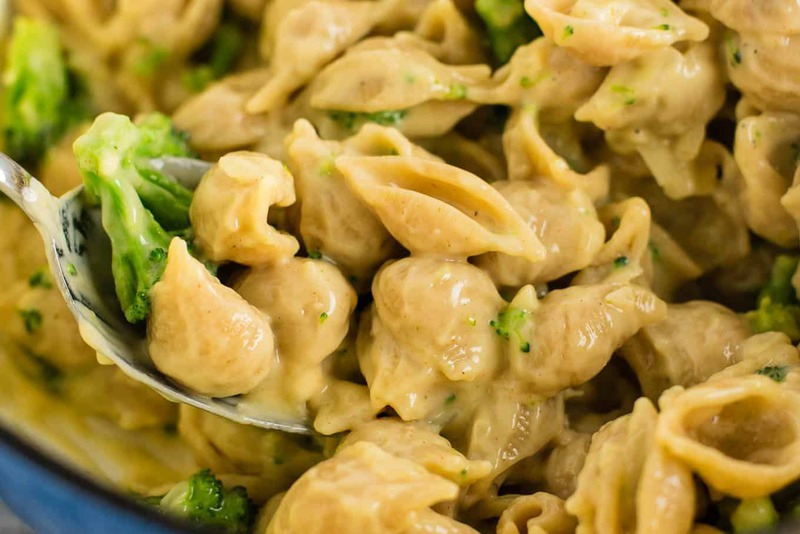 The sauce is made with 2% milk and freshly grated cheese, and it’s mixed with a whole bag of frozen broccoli and whole wheat pasta shells. I also added lots fresh garlic and onion because they are LIFE, but if you have a picky eater, you can halve the amounts I used and it will still be good. 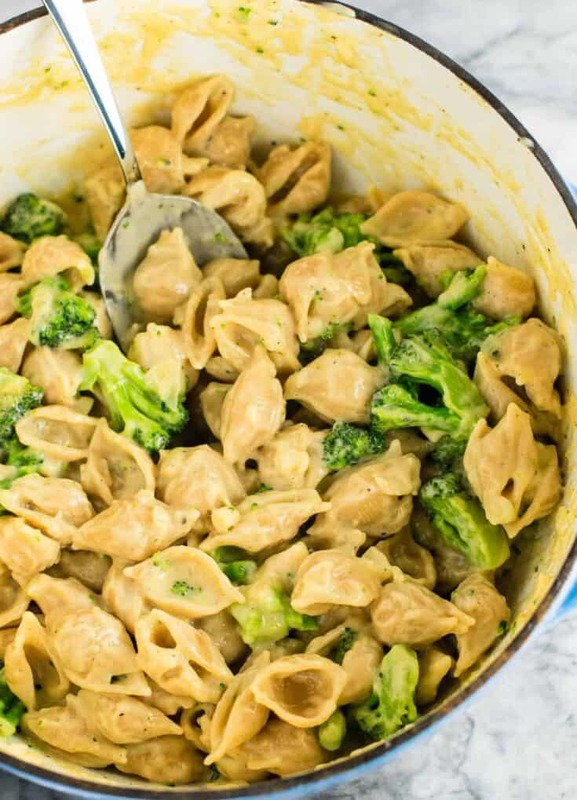 This broccoli mac and cheese turned out incredibly cheesy, creamy, and delicious. I didn’t feel bad at all after eating it and the broccoli made me feel less guilty for eating pasta for dinner. 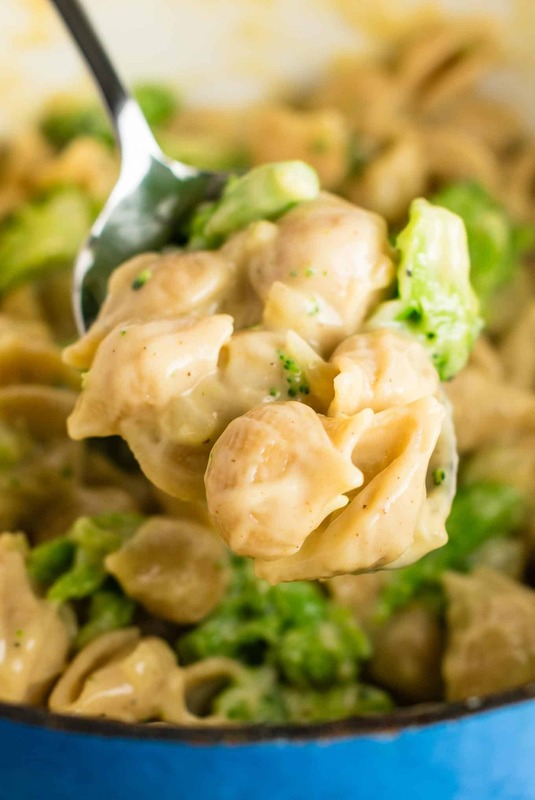 Honestly, whole wheat shells are the way to go if you’re a pasta lover. I’m super sensitive to pasta at times, but whole wheat pasta leaves me not bloated and feeling great. The thickness of the sauce kind of reminded me of velveeta, but it tastes WAY fresher. One note – be sure to buy blocks of sharp cheddar and grate it yourself. The flavor difference is huge and totally worth those extra few minutes spent grating! 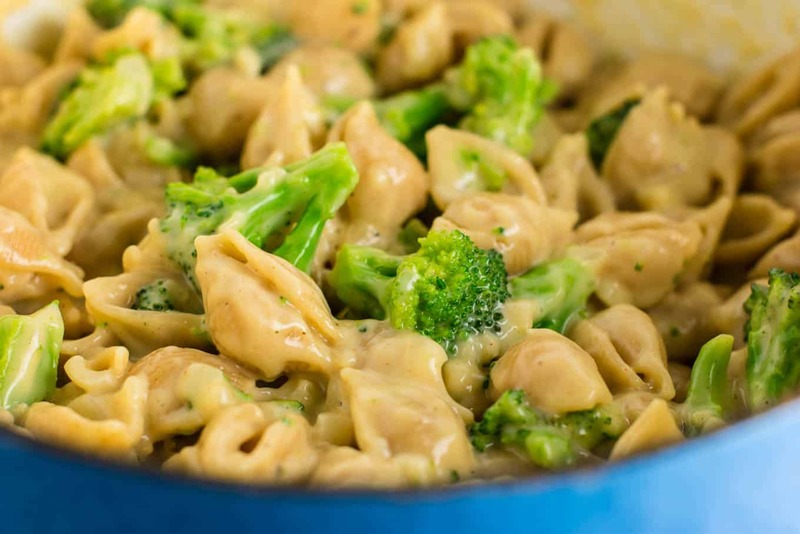 Broccoli mac and cheese recipe - lightened up comfort food for the whole family! Salt and pepper to taste (I used 3 teaspoons of salt and 1 teaspoon of pepper but did NOT salt my pasta water.) Add to taste to your liking! 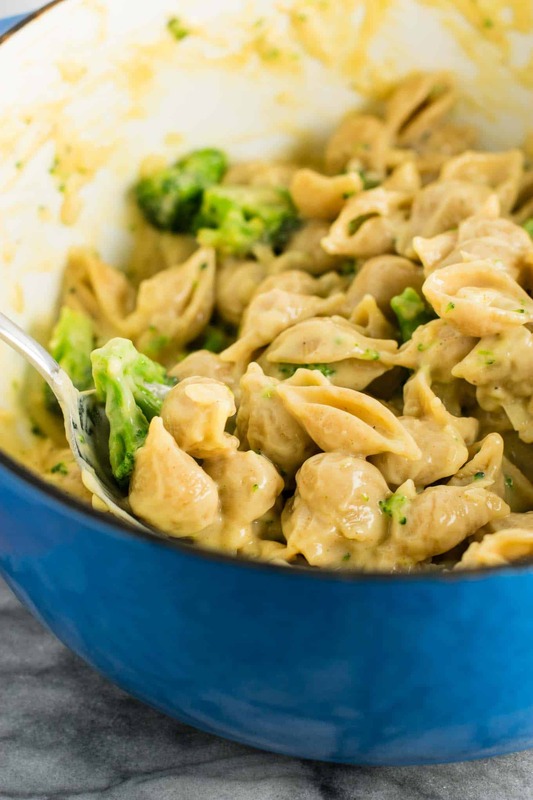 I love the added flavor of garlic and onion in this recipe, but if you are making it for kids that don't like it, feel free to cut the amounts in half. I added only two teaspoons of salt and even that was way too much. I would definitely only do one next time. Otherwise it’s a good recipe!